Anticipation and excitement are in the air as children wait for Santa to arrive. Did you ever wonder how St. Nick got into this gig? It’s deeply personal and heartwarming for two Santa Clauses I’ve met. It’s a way to give back. For one, it was a chance to connect with his child and others. Santas are everywhere – malls, street corners and on TV. On Christmas Eve, kids might keep their eyes on the skies or on the fireplace, hoping to spot that jolly old elf. But, this month while in church in Melbourne, Florida, I was startled to see a man with a white beard. He was wearing red coveralls and a crisp white shirt. Right after services, I dashed over to chat with him. Naturally, the kids beat me to him. I waited patiently while Lily, 5, and her brother J.J., 7, finished asking Santa about why his beard is curly and what his favorite vegetables were. Who knew? Santa loves guacamole. Lily said she loved that, too. After they left, I asked Santa why he does this. He became a Santa in 1983 at the Officers’ Wives Club when he was in the Air Force. A young lady asked him to deliver a gift to her boyfriend. Then, the following week, that young man asked Santa to deliver a gift to her. Right after Santa handed her the gift, her boyfriend came in, knelt down and proposed. Santa handed her the rings. Of course, she accepted. “That was my first time as Santa. I was hooked,” he said with a twinkle in his eyes. After a life-saving operation, his interest in being Santa intensified. For Gerald M. Hoppe, a Santa’s helper I met years ago at Shoppingtown in DeWitt, New York, his interest led him to write a book for his son, Marc, who is disabled. 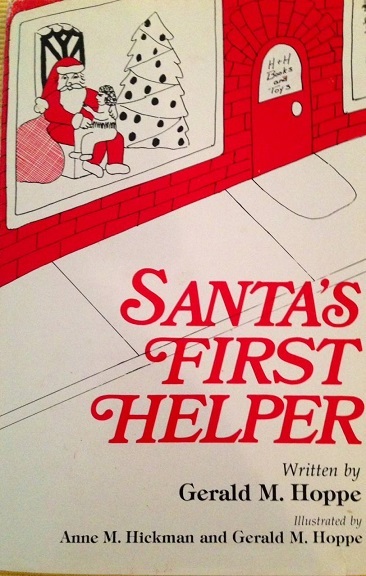 In “Santa’s First Helper,” (1987) Hoppe said he’s asked year after year by children who are “bewildered and curious” about all the Santas they see. After all, they ask, shouldn’t Santa be working with his elves at the North Pole to get all the presents ready? His story involves an elf taking what he believed was Santa’s power so that he could “be the one to make the children happy at Christmastime.” The elf soon regretted his decision, apologized and made amends. The Santa in Melbourne admits there is a certain power that comes along with the character he embodies. The stewardess apologized, wishing she was able to get him another seat. The problem? His seatmates would be two children who were already acting up. Well, he chuckled, they became the best of buddies and were good the rest of the flight. Merry Christmas, Happy Hanukkah, Joyous Kwanza and Happy Holidays. 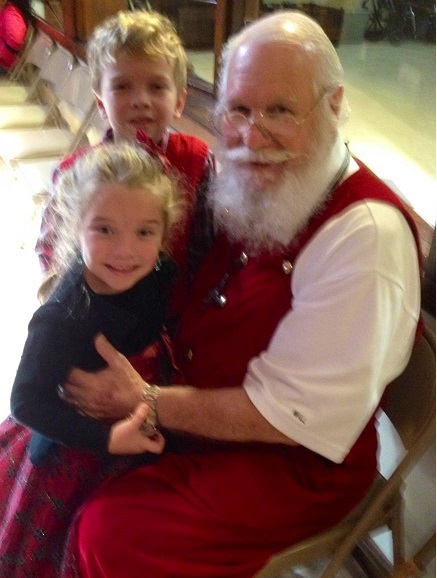 Photo: Santa with Lily, 5, and her brother, J.J., 7, at Ascension Catholic Community church, Melbourne, Florida. Next article So, What Are You Waiting For? 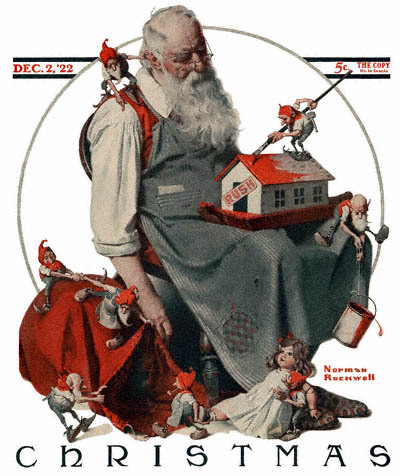 I love this Santa story and the visuals: I don’t believe I have seen this particular Rockwell painting either. One small detail made me chuckle: Lily and J.J. asking Santa to name his favorite vegetables. Imaginative and wise! Santa did seem to relish the moment and it all turned out well. 😉 Merry Christmas and Happy New Year, Diana. Hello, Judy! I don’t believe I’ve ever seen that wonderful Norman Rockwell painting of a very weary Santa. It’s just the best. And the photograph of Air Force Santa….wow, he really fits the bill, doesn’t he? I’m baking right now and listening to carols. Your post adds to my Christmas spirit. Thank you. Thank you for sharing their stories! Merry Christmas to you! I kinda figgered out Santa a big fraud when I was 5. Why did he have white adhesive bandage tape to keep his beard and mustache in place ? Smelled a hint of whiskey too. Carl, my brother also was on to the story about that same age. I hung on for a little longer. I still believe. 😉 About that whiff of alcohol, being a mall Santa is not for the weak. Merry Christmas and Happy New Year. Great tales for the spirit of Christmas, Judy, told in your special style. What present to come sliding down the WordPress chimney this this weekend! Merry Christmas to you, Dave and the family, my friend. Remember the big spread like this they had out every year in the Erie Canal Museum, Judy? We left Syracuse in 1999. So maybe it hadn’t happened yet. I love to see all the different sides of Santa. You paint a colourful and festive picture, Judy , thank you for that and a wish you a very Merry Christmas from here in the U.K . Imagine Melbourne Santa blackmailing those children! Good for him, I say. A grand holiday gift to all of us, Judy. Thank you. My favorite Santa example was the proposal with the ring! How sweet is that! That proposal really was sweet. Santa got a kick out of it. Merry Christmas and Happy New Year, Marilyn. Judy beautiful and touching story, what a gorgeous Santa he is. Have a merry Christmas and a bright and happy writing year next year. Kath. Kath … If I don’t see him at mass after Christmas, my suspicion that he is the REAL Santa will be confirmed. 😉 Merry Christmas and Happy New Year. Thank you for the good wishes. Right back at ya’. Judy he looks like the real deal to me. Thanks for shedding light on Santa! It’s always interesting to have a peek behind the scenes. Ho ho ho and Merry Christmas! Thank you for that lovely, heartwarming holiday story Judy! 🙂 Hope you had a wonderful Christmas. All best wishes to you and your family! Hi Judy, I am the author of “Santa’s First Helper”. Jerry Hoppe, the author, just called me to tell me about your blog. He is very glad to have been remembered after all these years (27) . Thanks to you for posting a picture of the cover as well. Hope the new year brings peace and health. Anne Hickman … I’m delighted to hear from you. I must have interviewed Jerry Hoppe when I worked for WHEN-AM radio in Syracuse, New York. I still treasure the book he autographed for me 27 years ago on 12-24-87. It hardly seems that that much time has flown by. I hope that you are both doing well. Wishing you all the best in 2015. Mark … There’s no way you’re Grinch-like material. You already have a very big heart.